Navy Expeditionary Medal : Jan 03 1961 to Jan 27 1961 for Cuba. Armed Forces Expeditionary Medal : Dec 01 1965 to Jan 29 1966 and Feb 10 1966 to Feb 18 1966 for Dominican Republic. The second Humming Bird, usually spelled Hummingbird (MSC-192), was originally classified: AMS-192, but reclassified 7 February 1955. She was launched by Quincy Adams Yacht Yard, Inc., Quincy, Mass., 27 January 1954; sponsored by Mrs. Felice Low; and commissioned 9 February 1955, Lt. (j.g.) W. J. Whitley in command. Following shakedown training off Key West in June, Hummingbird underwent minesweeping training at Charleston S.C., in July. From 21 October to 14 November she took part in her first amphibious exercises, sweeping the landing area and dropping marker buoy to guide the simulated assault on the shores of North Carolina. Arriving New York 8 January 1956, she took part in surveying work for the Hydrographic Office until 15 February, after which Hummingbird returned to Charleston. 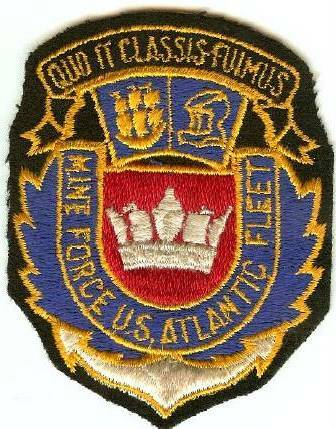 During 1957 and 1958 the ship was based at Mine Warfare School, Yorktown, Va., and in March 1958 she participated in another large amphibious operation at Onslow, North Carolina. In 1959 she shifted her home port to the amphibious base at Little Creek, Va., and continued to perform minesweeping duties during the periodic practice assaults on the Atlantic coast. She arrived Halifax, Nova Scotia, 6 October 1960 to take part in Sweep Clear V, a NATO minesweeping exercise with Canadian mine craft, returning to Little Creek 26 October. In July 1961 Hummingbird repeated this highly successful combined exercise in Canadian waters. The year 1962 saw more rigorous mine warfare training for Hummingbird, with amphibious operations at Onslow and in the Caribbean. The versatile ship also took part in a search for a downed Air Force plane off Delaware 1 June before departing for Panama City, Fla., to take part in mine experiments. September included a third NATO minesweeping exercise. As American naval power quarantined Cuba in October, Hummingbird stood ready in case larger operations were necessary, and in early 1963 took part in patrols off Cuba. From 1963 to 1967 the veteran minesweeper continued her training and readiness operations, a vital part of America's fighting power on the seas.